Homoeopathic medicines like Arnica and Staphysagria have demonstrated a significant role in wound healing and cicatrization process, concluded in a recent animal model study. As per the literature available, it is seen that homoeopathic medicines had positive effects on scar resolution but the scientific studies for showing its effectiveness are rarely found. A case report of post-burn HSc is presented here with a positive effect of the homoeopathic medicine Silicea in reducing the HSc. 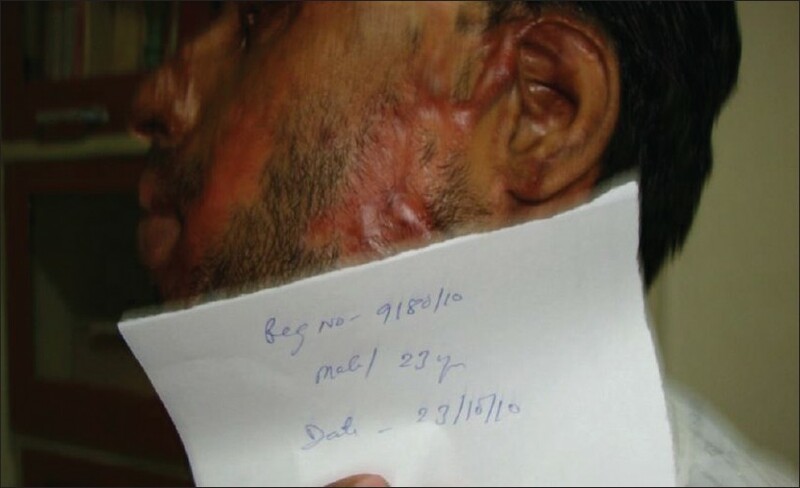 This case is an attempt to document the usefulness of homoeopathic treatment in post-burn scars. An increasing number of such cases will create an adequate database to enable a well-designed research study in this area. 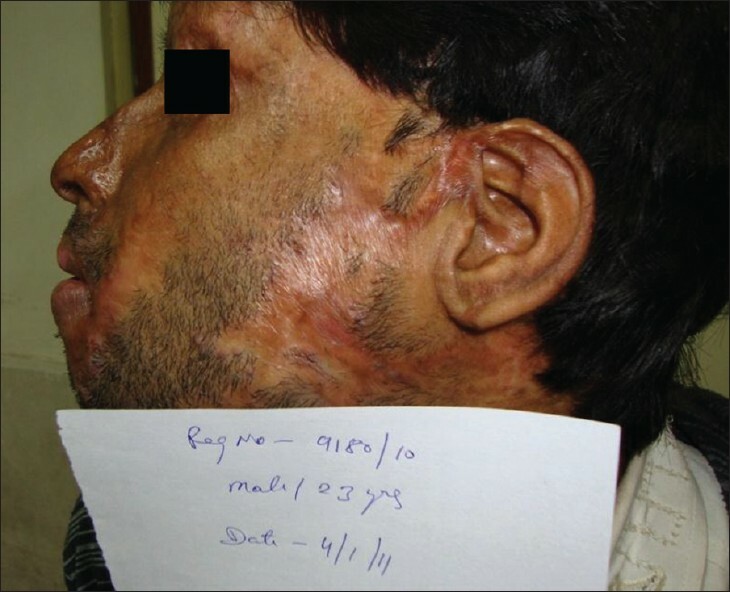 A young male of 23 years of age, an unmarried cloth merchant, suffered from acid burn on the left side of the face and left shoulder seven months previously when walking on the road. It was 4.5% burn as per the past reports of the Burn Department of Safdarjung Hospital, New Delhi. He was treated by allopathy with minimal improvement. Subsequently, he developed HSc on the left jaw since one month. He consulted at the outpatient department of the Homoeopathic Treatment Centre, Safdarjung Hospital, New Delhi. Presenting complaints were HSc post-burn scar since one month on the left jaw with severe itching, worsening at night and during perspiration. Pain was of a stitching type along with marked redness of the region [Figure 1]. The patient had a history of pneumonia in childhood and was treated with conventional medicines. Family history revealed nothing except filariasis in his mother. The patient was thin and tall in appearance with decreased thirst and appetite. He was habitually constipated with constant desire for defaecation. During physical and systemic examination, nothing abnormal was found. He lacked confidence in his work. When angry, he threw things. He sweated profusely during the daytime specially in morning leaving white stains on his cloths; he had disturbed sleep till midnight. In general, heat aggravated the patient's symptoms. The Vancouver Scar Scale (VSS)  , an internationally accepted scale for assessing scars, was used during pre and post-treatment assessment of HSc in this case. VSS [Table 1] consists of four variables: Vascularity, height (thickness), pliability, and pigmentation. In this case report, "Patient's VSS"- was used for the assessment of symptom of Itching. 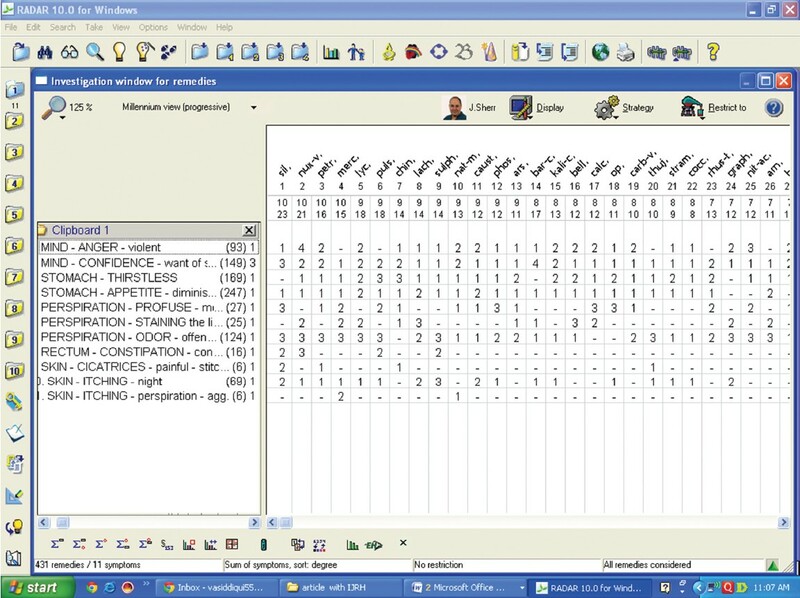 Each variable has four to six possible scores. The total score ranges from 0 to 16, where score 0 reflects normal skin. VSS score of this patient was 13 at baseline on October 23, 2010 and this reduced to 2 on February 4, 2011 during three months of follow-up with seven visits [Table 1]. SKIN - ITCHING - perspiration - agg. The patient was followed up on every 15 th day and the VSS score was filled after observation of the scar and measurement of its height. The score reduced from 13 to 2 in three months of follow-up and showed 84.6% improvement (marked improvement) in the scar [Figure 2]. Follow-up schedule is shown in [Table 1] as per the VSS score. This result shows the usefulness of the homoeopathic medicine Silicea in HSc. Redness, itching, and height of scar are reduced as shown post treatment [Figure 2] after the prescription of Silicea compared to the pretreatment stage [Figure 1]. In this case report, the patient showed improvement after the homoeopathic medicine not only in the scar but also in other associated complaints; stools became satisfactory, appetite and sleeping pattern improved, and so on. Only three doses of Silicea 30 were prescribed at baseline during the whole period of treatment. Pigmentation, height, vascularity, pliability, and itching of HSc improved markedly with the homoeopathic medicine. In the conventional system, silicone gel or sheath are used for the treatment of HSc;  coincidentally, in this case, potentized Silicea was prescribed on the basis of the totality of symptoms with marked improvement. It is interesting to know that the silica as a substance is useful in HSc scar treatment in a crude form like gel as well as in homoeopathic potency. However, phases of scar evolution can be protracted, and a tremendous range exists between the time that a scar becomes hypertrophic in the first few months to the time that it completely resolves with little or no treatment. In this case report also, we cannot exclude the chances of spontaneous resolution of scar or resolution due to delayed response to allopathic treatment. Though the homoeopathic treatment has shown favourable results in this case, in the future, randomized controlled trials with larger sample size are required for validation of the effects of the homoeopathic treatment. The authors express their heartfelt gratitude to the former Director General Prof. (Dr.) C. Nayak and the present Director General of the Central Council for Research in Homoeopathy (CCRH), Dr. R. K. Manchanda for their continued guidance and encouragement. They also gratefully acknowledge the patient who co-operated wholeheartedly during the treatment. 1. Meenakshi J, Jayaraman V, Ramakrishnan KM, Babu M. Keloid and hypertrophic scar: A review. Indian J Plast Surg 2005;38:175-9. 2. Bloemen MC, van der Veer WM, Ulrich MM, van Zuijlen PP, Niessen FB, Middelkoop E. Prevention and curative management of hypertrophic scar formation. Burns 2009;35:463-75. 3. Bombaro KM, Engrav LH, Carrougher GJ, Wiechman SA, Faucher L, Costa BA, et al. What is the prevalence of hypertrophic scarring following burns? Burns 2003;29:299-302. 4. Alecu A, Alecu M, Mãrcus G. Effect of thehomoeopathic remedies Arnica montana and Staphysagria on the time of healing of surgical wounds. Cultura Homeopática 2007;20:19-21. 5. Draaijers LJ, Tempelman FR, Botman YA, Tuinebreijer WE, Middelkoop E, Kreis RW, et al. The patient and observer scar assessment scale: A reliable and feasible tool for scar evaluation. Plast Reconstr Surg 2004;113:1960-5. 6. Boericke W. Pocket Manual of Homoeopathic Materia medica and repertory. Rep. ed. New Delhi: B Jain Publishers; 1998. 7. Leaman AM, Gorman D. Cantharis in the early treatment of minor burns. Arch Emerg Med 1989;6:259-61. 8. Foubister DM. Homoeopathy and scar tissue observations on the influence of certain potentized substance on scar tissue. Br Homoeopath J 1975; 60-64. 9. Van den Kerckhove E, Stappaerts K, Boeckx W, Van den Hof B, Monstrey S, Van der Kelen A, et al. Silicones in the rehabilitation of burns: A review and overview. Burns 2001;27:205-14. 10. Atiyeh BS. Nonsurgical management of hypertrophic scars: Evidance-based therapies, standard practices, and emerging methods. Aesthetic Plast Surg 2007;31:468-92.